Let me show you how to make a cheap baby gift basket. With cheap I mean inexpensive and not looking cheesy at all! I have frugal tips and ideas for you since you can save a lot if you just know how! Basically, an inexpensive gift basket for a newborn is made the same way, as any other gift box. That's why you might like to check out my page about how to make a newborn baby gift basket, too. Then come back and read my ideas on how to make a low budget version for around 15 bucks that still looks absolutely beautiful and no-one will guess it was made that low-priced. First of all, the basket can be a box, too! And it does not necessarily have to be a new one. Why not search your basement for a suitable box and decorate it nicely? Empty fruit baskets, small laundry baskets, a big bread basket or even a shoe box are great for that purpose. If you do not have anything that fits at home, go to the supermarket and see whether you can get a free box (for example a fruit or vegetable basket) from there. Alternatively, go to your local crafts store, to the Thrift Store or the Dollar Store or to a similar store concept. You will surely find something suitable and inexpensive there. You might even find a cardboard box with a baby theme in pink or blue. Have a look at my bargain below! If you need to pimp up your box, decorate it with stickers and put a burp cloth that overlaps the box or even cheaper a colorful napkin in it. The basket I have used above is a cardboard fruit basket (originally used for apples) where I simply put some baby stickers on. It does look nice and if made for that purpose, doesn't it? For a baby girl gift basket use pink as your main color. I got the box pictured below for just 2 Dollars. The lid can go under the box. For a baby boy blue is the perfect color and for a unisex gift yellow, orange and beige are fine. If you need to buy a new basket consider taking one which comes in handy for the new family later on, too. For example a fabric-lined basket can serve as a box to keep diapers on the changing table while a cardboard box can be used to collect baby's keepsakes. 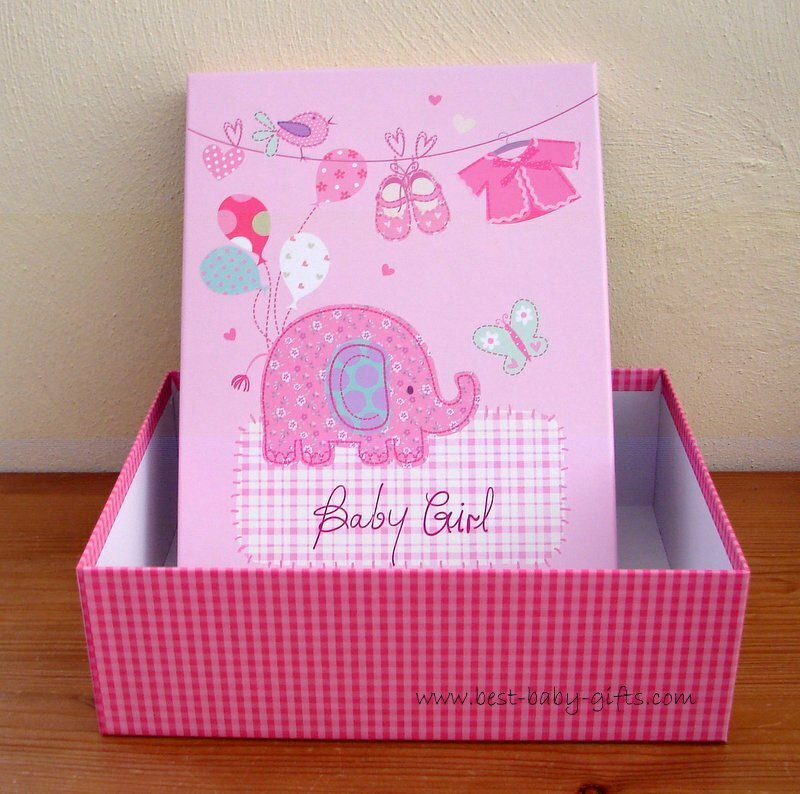 perfect box for making a baby girl gift basket! Also, baby body care products always are a good choice since most of them can be used for a long time. So even if the new parents get tons of these, you never can have too many! Select a good variety of baby shampoo, baby lotion, powder, baby oil, baby bath, baby sunscreen lotion, diaper rash ointment, diapers, etc. Look out for trial sizes or travel pack sizes which will save you big. When at the Dollar Store, have a look for baby photo props or baby shower muffin decorating sets. Usually they have a stick to hold and can be placed in a basket easily. When browsing through a baby store you'll surely find a lot more things that fit into your basket as the choice is vast and you might catch some cool items on sale. Another good idea is to include an issue of a parenting magazine. Place your items in a nice way into the box or basket. Sometimes it can be helpful to fill the bottom of the basket with some cotton balls, flat or rolled diapers, a baby cloth or even some scrunched up paper. Then all your things might fit into the basket more smoothly. 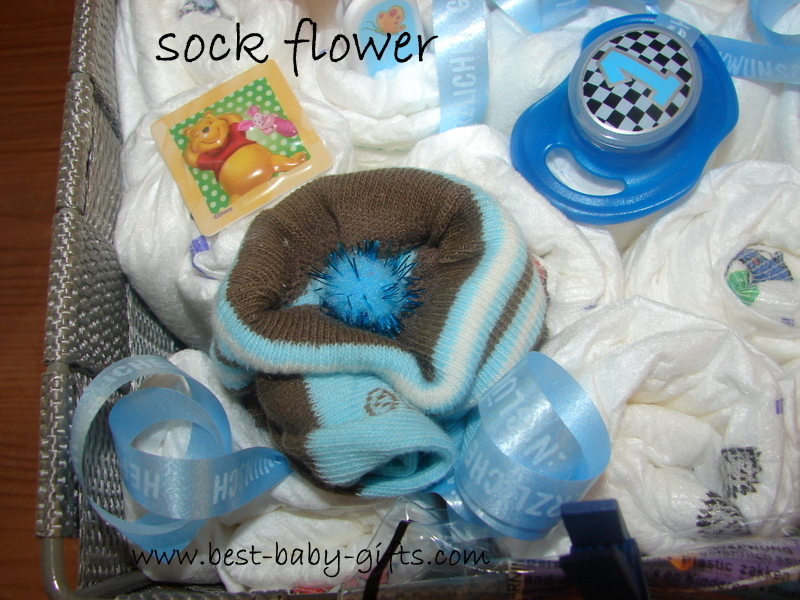 If you have onesies, bibs or socks you can roll them up and make little and decorative flowers or cupcakes: how to make sock flowers. For that last piece of perfection use clear gift foil wrap as well as a broad ribbon, or even several thin ribbons to decorate your cheap baby gift basket. This makes your gift look rather 'lavish'! Et voila, here you have a very beautiful, yet inexpensive baby gift basket! a cheap baby gift basket needs not look cheap at all! How about adding a babysitting coupon or a coupon for your help in the household or garden? They do not cost you any money! 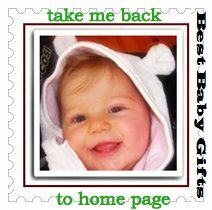 See the details here: free baby gift coupons to add to your baby gift basket. If you want to include baby clothing into your basket, to make savings, buy anti-seasonal but consider you'll need a bigger size so it will still fit baby by the time of the year.